Agartala a town with glorious past and the present site of Agartala was chosen by Maharaja Krishna Kishore Manikya Bahadur, who shifted the capital from old Agartala to its present site in the late forties of the last century. There are good number of temples and shrines worth visiting in this place. This state of Tripura is surrounded on north, west and south by Bangladesh and on the east by the state of Mizoram, and on the northeast by the state of Assam. It is just 2kms away from the country Bangladesh. Agartala is the capital of Tripura.This is the second smallest state in the country and was formed by Maharaja Radha Krishna Kishore Manikya Bahadur in 1850.But however it become more prominent only after Maharaja Krishna Manikya who made Agartala his state capital.Tripura became a self-ruling princely state after it was conquerd by the British. After its entry into the Indian Union and after a long struggle it got its statehood in 1972.Agartala is known for its palaces, temples and monuments and a very major portion of the state is still forested, thus giving a pollution free clear atmosphere, attracting tourists. The main attraction of the state is its varied tribal culture and the beautiful handicrafts. The best time to visit this city is anywhere between September to March. Durga Puja - This puja is celebrated in the months of October to November reflecting the culture of the people of Agartala. Saraswathi Puja - Saraswati Poojas is celebrated on the 5th day of Magha month of Vedic Calendar along with Navaratri. Garia puja - This is the traditional tribal festival celebrated in April during which they worship the mother of earth. Kharchi puja and Ker puja - These two festivals are celebrated in July where the gods of tribal kings are worshipped. Pous Sankranthi Mela - This festival is celebrated on 14th January and it attracts crowd even from the neighbouring state. 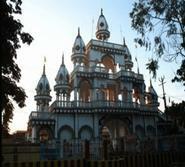 UMMANESHWAR TEMPLE - This is one of the famous temple of Agartala which is orange in color. 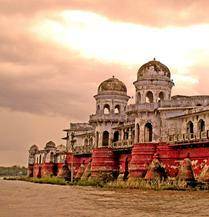 LAXMI NARAYAN BARI - This temple is in Palace Compound. This temple is situated on the bank of Gomati at Udaipur in Tripura.This is 55kms away from Agartala and is nearold Royal palace of Maharaja Govinda Manikya. This tempel has the back-drop of the famous novel "Rajarshi" and the drama "Bisharjan" composed by Rabindranath Tagore. JAGANNATH TEMPLE-This temple depicts the various stages and episodes of Lord Krishna. 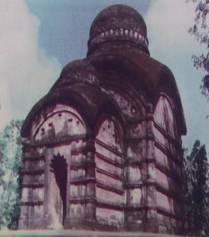 MAHADEV AND TRIPURA SUNDARI TEMPLE-This temple is 55km away from Agartala in Udaipur. This mosque is known for its decoration done with broken crockery pieces. This Greek styled palace is now the Assembly house of Tripura.Though it is not open to the public there is an entry pass given at the main gate between 3pm to 4 pm.It is a three storeyed castle with three spectacular domes covering over 800 acres. COLLEGE TILLA - College Tilla got its name so for it is situated on a hillock in the south eastern part of the state. This includes Maharaja Bir Bikram College, Tripura University buildings, international cricket stadiums, football grounds, serene natural lakes and picturesque lush landscapes. Exhibition of ethnographical and archeological items can be seen here in this museum which is on the main HGB road. The entry to this museum is free. This involves stuffs of most of the tribal groups and is located behind the tourist office. This palace is at a distance of 1 km away from the Ujjayanta Palace and only the southern part of the Palace known as Rabindra Kanan is open to the public whereas the rest is the residence of the Tripura governor. This lake palace is the only one of its kind in eastern India, is a mix of Hindu and Mughal architect built in the middle of Lake Rudrasagar. 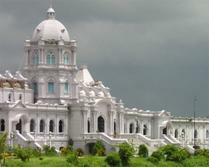 It is about 55 km from Agartala and one of the famous tourist destination. This hill is 300 ft above sea level and is nearly 200 km from Agartala.This s a blend of spring and nature giving a clear and non polluted atmosphere. 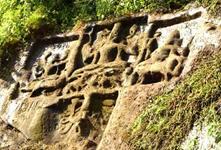 This place is known for its rock carvings dating back to 15th and 16th Century. The rocks here take up the images of Hindu gods and other deities. This temple is in old Agartala which is about 14km away from the city. There is saying that one who visits this temple, comes in Agartala fourteen times more. This is a jungle of wide area in the place called Belonia and is about 100 Km. away from Agartala.This jungle is noteworthy for its bison and other migratory birds and also different species of monkey. This lake is about 115 km away from the city and it includes attractions like migratory birds and Water sports. It is surrounded by green vegetation. This park maintained by the government is in the northern part of the town is engraved with rare species of plants and flowers. Along with this it is decked with fountain, stream and pond. 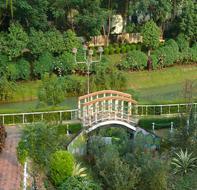 This is an amusement kind of park and it is the only and one of its kind in the entire North-east. It involves fungames, watergames, various rides etc. L. N. Bari Road, Agartala. By air it takes about 45 minutes to reach Agartala from Calcutta and Guwahati.They have regular flight services connecting to different parts of North India like Delhi, Kolkata, Shillong and Guwahati.The major Airline Service Providers are Air India, Jet Airways, Indigo Airlines, Kingfisher Airlines, Air Deccan,etc. The nearest railway station to Agartala is Kumarghat which is at a distance of about 140 kms which connects Guwahati and Tripura. This rail line is getting to be extended upto Agartala in the coming years. Agartala is well connected by road to other parts of Tripura and via Shillong to Guwahati.Good luxury coaches, both of private travel agencies and public sector transport corporations ply on this road.